The CPM today made it clear that it did not support the Cabinet’s decision to include ‘creamy layer’ in OBC quota for educational institutions and that the party would raise the matter when the The Central Educational Institutions (Reservation in Admission) Bill, 2006, would be tabled in Parliament. 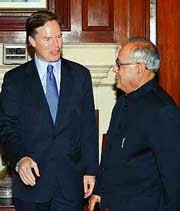 Congressional negotiators on Thursday finalised a US-India civilian nuclear cooperation Bill after watering down provisions and eliminating language that both New Delhi and President George W. Bush's administration had said were outside the parameters of the July 18, 2005, agreement. Prime Minister Manmohan Singh today called off a three-day visit to the Philippines from Monday after the postponement of a summit of Asian leaders on Cebu island due to concerns over an incoming tropical storm. Annoyed over the dilly-dallying approach of the government on the Women’s Reservation Bill, women MPs, cutting across party lines, attacked the government for the inordinate delay in tabling the Bill and forced the adjournment in the Rajya Sabha today. Refusing to succumb to the pressure of agitating students, protesting against the Lyngdoh committee report, Lucknow University Vice-Chancellor R.P. Singh today closed the university and its seven associated colleges sine die and cancelled the student union poll, scheduled for December 16. Notwithstanding the ongoing controversy surrounding the granting of special economic zone (SEZ) status to industries across the country, the Punjab Government has forwarded three more proposals to the Government of India for the grant of the SEZ status to certain sector specific industries in the state.